Boston Town chairman Mick Vines says he has been ‘amazed’ by the calibre of managers who want to take over the club... but he won’t be rushed into making an appointment. Dan Barrett and his assistant Carl Foreman stepped down from their roles following Saturday’s 2-1 victory at Long Buckby. Player-director Lori Borbely will take over in the dug-out for the final 14 matches of the campaign while Vines and the board select the canditate who they believe can bring stability to the DWB Stadium. “I was amazed by the three people who have already rung me about the job,” Vines told The Standard. “There are some very good managers who want to come here. 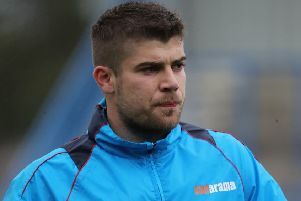 Vines believes it is imperative that the Poachers find someone who plans to remain at the club for the foreseeable future, after Borbely (pictured) became Town’s sixth manager in four years. “Bob Don-Duncan was manager here for 19 years,” he added. “After that we’ve had five managers in four years. “That’s not the Boston Town way.